We would like to put together a photo essay of the role of trash in the Occupy movement, from protesters being called “dirty hippies,” to the greywater system protesters set up before Zuccotti park was evicted. If you have images you own the copyright to or you have from media commons, please send to max.liboiron@nyu.edu. 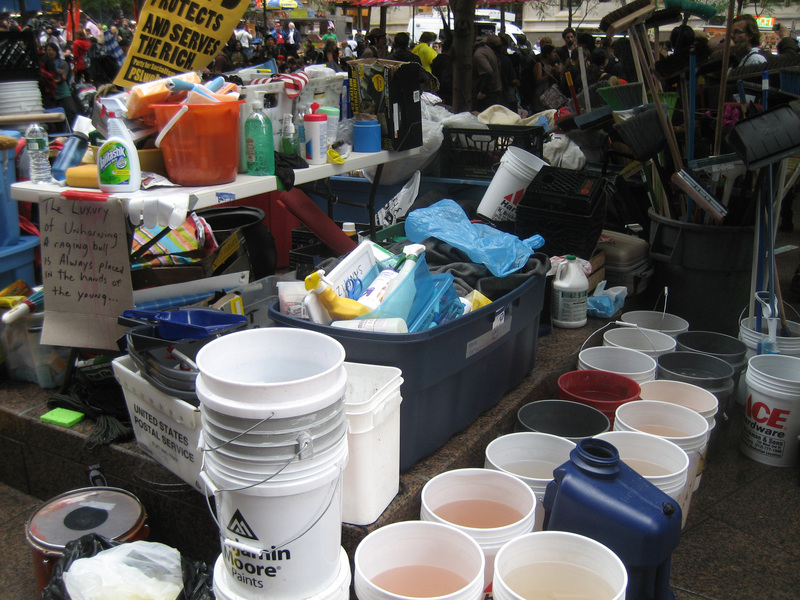 #OWS October 14th before the big clean up. Photo by Samantha MacBride. This entry was posted in Activism, history, Urban, Waste. Bookmark the permalink. I find it a great idea. I have made some photos about it. We could use http://99percentmedia.org/py archive) and make the archiving process open. What do you think? We could use a tag to identify them. Sounds great! Is the archive open source/copy left? I notice that right now there is no tag about waste, trash, or garbage. The project has the will to share and curate the content, I do not know if they have a licenses or the people mantain their own licenses. They do not host the archive, they just redistribute-organize the content. We can ask about that, and also create the tag. It’s interesting the relationship of the movement with waste. In Barcelona the camp was evicted because they have to clean it. Classical excuse! Yes, part of the impetus for this project is the rhetoric and power of “cleaning up” that both sides use. Thank you for starting the tag. Now that we have almost 300 images of how waste, rubbish, trash, filth and sanitation has been used in reference to the Occupy movement, it becomes clear that “both sides,” though of course there are many sides involved in these discussions, feel that the media is misrepresenting un/sanitation. This pingback will make an excellent footnote to the archive.